“A few days ago, I announced the installation of Shirdi Sai Baba statue in AstroVed centers. It is a very important step forward. Now, there was an intuition that came to me from Sai Baba, telling that most people are hurt for money. So, you have to install an exclusive Shirdi Sai Baba’s statue for removing financial problems. This Sai Baba will be known as Kalpa Viruksha Kamadhenu Kubera Sai Baba. You just call on him exclusively for financial blessings and also blessings to remove your debts and other problems related to money. There is also another Sai Baba that is going to be established, and that is Noi Nivarana Sai Baba. Noi in Tamil means disease. He is the one who is going to remedy the physical problems and diseases. So, as of now, there are 3 additional statues. The one is the general Shirdi Sai Baba, he will be called the Dattatreya Shirdi Siva Sai Baba. Dattatreya is the Trinity, corresponding to Brahma, Vishnu and Shiva. Sai Baba is the avatar of Dattatreya, who is the Trinity. With Dr. Pillai’s guidance and our member support, we have successfully installed 4 statues of Shri Shirdi Sai Baba on his 100th MahaSamadhi day and Vijayadasami (Day of Victory). We invite you to donate as a sponsor for the maintenance of our Shirdi Sai Baba statues to have your name and birth star included in ongoing Poojas and Abishekams (Hydration Pooja) on Mondays and Thursdays to invoke the continual blessings and protection of our 4 special Shirdi Sai Babas. During his lifetime, Shirdi Sai Baba performed miracles to resolve life problems of those who trusted him, as well as those who doubted him. The holy scripture named ‘Sai Satcharita’ highlights that every person who met Shirdi Sai Baba received his teachings and blessings. Through the many miracles performed by Shirdi Sai Baba, he demonstrated the purpose of his life. Sai Satcharita commences with the miracle of Shirdi Sai Baba saving the lives of Shirdi people from the deadly epidemic of that time, Cholera. 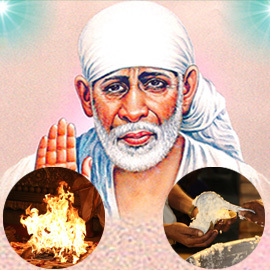 One day in the mosque, Shirdi Sai Baba started to grind wheat to make flour. People who had come to have his darshan wondered about his act, but none questioned him. News started to spread. After some time, 4 women in the crowd came to him and took over the grinding task from him. 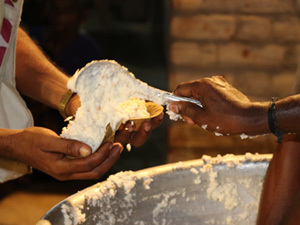 After grinding was over, Shirdi Sai Baba instructed them to put this flour around the village. Later, the people realized that after doing the same, the cholera epidemic subsided and did not harm the people in Shirdi. 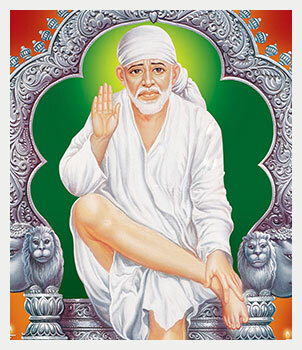 Narayan Motiram Jani of Nasik was Shirdi Sai Baba’s devotee. Once, a friend of Narayan was stung by a scorpion, and the pain was severe and unbearable. 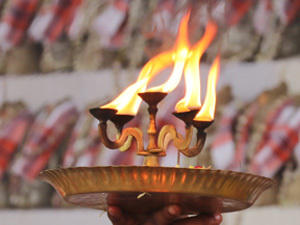 Udi (ash from Baba’s sacred fire ‘dhuni’) is considered most effective in such cases. Hence, Narayan searched for the ash but could not find it. Then he stood before Baba’s picture and asked for his help, chanted Baba’s name and took a pinch of the ashes from the incense stick burning in front of Baba’s picture. Considering it as Baba’s Udi, he applied it on the sting, upon which the pain vanished. Donate for our Shirdi Sai Baba statue maintenance to have your name included in ongoing Poojas on Mondays and Thursdays to invoke the continual blessings and protection of Shirdi Sai Baba. 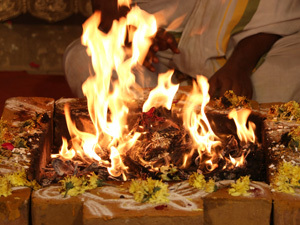 You will receive the Vibhuti (sacred ash), which will be blessed in the rituals. Keep this on your meditation altar and wear it on your forehead during meditation or at other times to expand the Divine blessings into your life. Please Note: Your prasad will be shipped from Chennai, Tamil Nadu, once in three months. For international shipping, please allow 2 – 4 weeks for delivery. Donate for our Shirdi Sai Baba statue maintenance to have your name included in ongoing Poojas on Mondays and Thursdays to invoke the continual blessings and protection of Shirdi Sai Baba. Once you donate, you will be receiving the coupon for 10% discount on all our Monthly Specials in a separate email.